A Quote- Don't make me angry, you wouldn't like me when I'm angry. Computer Program / Repair: 7D, Electronics: 7D, (A) Electrical Engineer: 3D, Ground Vehicle Repair: 4D, Security 5D, First Aid: 6D+2, (A) Medicine: 5D. 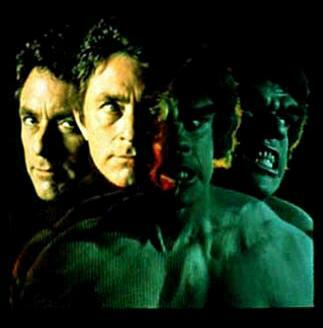 Whenever Bruce experiences extreme emotional responses derived from anger, pain or panic, he transforms into the Hulk. As a result of this physical transformation his intelligence drops drastically and his strength increases proportionately. As a result he goes from being a 5'9" man to being a 9'0" hulking creature with the intelligence of a 4 year old. He loses all use of the Banner related skills and may only use the skills denoted as Hulk related skills, so noted with an (H) before them. The Hulk has Body Armor at 3D and is considered to be Walker Scale for the purposes of resisting damage from attacks. The Hulk can leap great distances and is frighteningly strong, in theory he could take down a Rancor with little to no problem. Robert Bruce Banner was born in Dayton, Ohio, to Dr. Brian and Rebecca Banner. As a child, Bruce was abused by his alcoholic father, who killed his wife when she and Bruce tried to escape from one of his drunken rages. Later, Bruce was raised by his aunt when his father became institutionalized. Burying his emotions throughout his childhood, Banner had developed over time a deep and repressive personality. A genius in nuclear physics, Robert Bruce Banner went to work for the United States Defense Department nuclear research facility at Desert Base, New Mexico. There, Banner met General Thaddeus E. "Thunderbolt" Ross, the Air Force officer in command of the base, and Ross' daughter Betty. Banner and Betty Ross eventually fell in love with each other. Banner designed and oversaw the construction of the "gamma bomb" or "G-bomb," a nuclear weapon that had a high gamma radiation output. At one point, Bruce's father was released from his mental facility. Reluctantly Bruce agreed to let his father live with him, although he again acted belligerently towards Bruce. On the anniversary of his mother's death, Bruce visited her grave but was attacked by his father. Fighting back, Bruce accidentally killed his father by causing him to fall and crack his skull on Rebecca's tombstone. Bruce repressed the memory of his actions and the police dismissed the death as a random mugging. Banner was present in the instrumentation bunker at the test site for the first underground trial detonation of the gamma bomb. Observing that a civilian had breached security and entered the restricted test area, Banner told his colleague Igor Starsky to get the civilian to safety. Starsky, secretly a Soviet agent, did nothing. He was confident that Banner would die in the explosion, bringing the project to a halt. Reaching the civilian, a teenager named Rick Jones, Banner threw him into a protective trench. Before Banner could get himself to safety, the gamma-bomb detonated, and intense waves of radiation hit the surface. Banner was irradiated with highly-charged radioactive particles. At first, Banner changed into a gray-skinned yet intelligent behemoth at sunset (dubbed "the Hulk" by a spectator) and reverted to human form at dawn. For a short time, Bruce could control the transformations using gamma radiation projectors in his secret desert laboratory, maintaining rudimentary intelligence in the Hulk's alter ego. Even so, the Hulk became a green-skinned monster possessing little of Banner's memory or intelligence and easily enraged. Hence, the Hulk became a menace continually hunted by military forced commanded by the implacable Thunderbolt Ross. The Hulk was joined by Rick Jones, who felt responsible for Banner's condition. Doctor Bruce Banner was a captive at Area 51, being held by the Imperials who wanted him to construct a Gamma bomb for their use. When the Mutt Squad found him he was mid-way through his change and when he Hulked out. He became fixated on Skizzle the Squib and picked him up by his neck and carried him around under his arm until he died. The Hulk then ate the Squib thinking he was a tasty treat. The remains were buried later by the Mutt Squad.